Winfield Township, DuPage County / Batavia Township, Kane County, near Batavia, Illinois, U.S.
Fermi National Accelerator Laboratory (Fermilab), located just outside Batavia, Illinois, near Chicago, is a U.S. Department of Energy national laboratory specializing in high-energy particle physics. As of January 1, 2007, Fermilab is operated by the Fermi Research Alliance, a joint venture of the University of Chicago, Illinois Institute of Technology and the Universities Research Association (URA). Fermilab is a part of the Illinois Technology and Research Corridor. Fermilab's Tevatron was a landmark particle accelerator; at 3.9 miles (6.3 km) in circumference, it was the world's second-largest energy particle accelerator (after CERN's Large Hadron Collider, which is 27 km in circumference), until it was shut down in 2011. In 1995, the discovery of the top quark was announced by researchers who used the Tevatron's CDF and DØ detectors. In addition to high-energy collider physics, Fermilab hosts smaller fixed-target and neutrino experiments, such as MiniBooNE and MicroBooNE (Mini Booster Neutrino Experiment and Micro Booster Neutrino Experiment), SciBooNE (SciBar Booster Neutrino Experiment) and MINOS (Main Injector Neutrino Oscillation Search). The MiniBooNE detector is a 40-foot (12 m) diameter sphere that contains 800 tons of mineral oil lined with 1,520 phototube detectors. An estimated 1 million neutrino events are recorded each year. SciBooNE is the newest neutrino experiment at Fermilab; it sits in the same neutrino beam as MiniBooNE but has fine-grained tracking capabilities. The MINOS experiment uses Fermilab's NuMI (Neutrinos at the Main Injector) beam, which is an intense beam of neutrinos that travels 455 miles (732 km) through the Earth to the Soudan Mine in Minnesota. In the public realm, Fermilab hosts many cultural events: not only public science lectures and symposia, but also classical and contemporary music concerts, folk dancing and arts galleries. The site is open from dawn to dusk to visitors who present valid photo identification. After Wilson stepped down in 1978 to protest the lack of funding for the lab, Leon M. Lederman took on the job. It was under his guidance that the original accelerator was replaced with the Tevatron, an accelerator capable of colliding proton and an antiproton at a combined energy of 1.96 TeV. Lederman stepped down in 1989 and remains Director Emeritus. The science education center at the site was named in his honor. Nigel Lockyer became director in September 2013. Fermilab continues to participate in the work in the LHC; it serves as as a Tier 1 site in the Worldwide LHC Computing Grid. The first stage in the acceleration process takes place in the Cockcroft–Walton generator, which turns hydrogen gas into H− ions. The gas is introduced it into a container lined with molybdenum electrodes, each a matchbox-sized, oval-shaped cathode and a surrounding anode, separated by 1 mm and held in place by glass ceramic insulators. A magnetron generates a plasma to form the ions near the metal surface. The generator applies a 750 keV electrostatic field, accelerating the ions from the container. The next step is the linear accelerator (linac), which accelerates the particles to 400 MeV, or about 70% of the speed of light. Right before entering the next accelerator, the H− ions pass through a carbon foil, becoming H+ ions (protons). The next step is the booster ring, a 468 m-circumference circular accelerator whose magnets bend beams of protons around a circular path. The protons travel around the Booster about 20,000 times in 33 milliseconds, adding energy with each revolution until they leave the Booster with 8 GeV. The Main Injector is the next link in the accelerator chain. Completed in 1999, it has become Fermilab's "particle switchyard". It has three functions: it accelerates protons, it delivers protons for antiproton production, and it accelerates antiprotons coming from the antiproton source. The final accelerator is the Tevatron. It is the second-most powerful particle accelerator in the world, after CERN's Large Hadron Collider. Traveling at almost the speed of light, protons and antiprotons circle the Tevatron in opposite directions. Physicists coordinate the beams so that they collide at the centers of two 5,000-ton detectors DØ and CDF inside the Tevatron tunnel at energies of 1.96 TeV, revealing the structure of matter at the smallest scale. Fermilab's first director, Wilson, insisted that the site's aesthetic complexion not be marred by a collection of concrete block buildings. The design of the administrative building (Wilson Hall) harks back to St. Pierre's Cathedral in Beauvais, France. Several of the buildings and sculptures within the Fermilab reservation represent various mathematical constructs as part of their structure. Fermilab is dismantling the CDF (Collider Detector at Fermilab) and DØ (D0 experiment) facilities, and has been approved to continue moving forward with MINOS, NOνA, G-2, and Liquid Argon Test Facility. Fermilab has been approved and currently stands to become the world leader in Neutrino physics through its Long Baseline Neutrino Experiment (LBNE). Other leaders are CERN, which leads in Accelerator physics with the Large Hadron Collider (LHC), and Japan, which has been approved to build and lead the International Linear Collider (ILC). "Over 350 people from over 60 institutions participate in the Long-Baseline Neutrino Experiment (LBNE), working together to plan and develop both the experimental facilities and the physics program. LBNE is expected to be fully constructed and ready for operations in 2022. LBNE plans a world-class program in neutrino physics that will measure fundamental physical parameters to high precision and explore physics beyond the Standard Model. The measurements LBNE makes will greatly increase our understanding of neutrinos and their role in the universe, thereby better elucidating the nature of matter and anti-matter. LBNE will send the world's highest-intensity neutrino beam 800 miles through the Earth's mantle to a large detector, a multi-kiloton volume of target material instrumented such that it can record interactions between neutrinos and the target material. Neutrinos are harmless and can pass right through matter, only very rarely colliding with other matter particles. Therefore, no tunnel is needed; the vast majority of the neutrinos will pass through the mantle's material, and in turn, right through the detector. The experiment will thus need to collect data for a decade or two since neutrinos interact so rarely. Fermilab, in Batavia, IL, is the host laboratory and the site of LBNE's future beamline, and the Sanford Underground Research Facility (SURF), in Lead, SD, is the site selected to house the massive far detector. The term "baseline" refers to the distance between the neutrino source and the detector. Why neutrinos: Neutrinos, astonishingly abundant yet not well understood, may provide the key to answering some of the most fundamental questions about the nature of our universe. The discovery that neutrinos are not massless, as previously thought, has opened a first crack in the highly successful Standard Model of Particle Physics. Neutrinos may play a key role in solving the mystery of how the universe came to consist only of matter rather than antimatter." "In the summer of 2013, the Muon g−2 team successfully transported a 50-foot-wide electromagnet from Brookhaven National Laboratory in Long Island, New York, to Fermilab in one piece. The move took 35 days and traversed 3,200 miles over land and sea." "Muon g−2 (pronounced gee minus two) will use Fermilab's powerful accelerators to explore the interactions of short-lived particles known as muons with a strong magnetic field in "empty" space. Scientists know that even in a vacuum, space is never empty. Instead, it is filled with an invisible sea of virtual particles that—in accordance with the laws of quantum physics—pop in and out of existence for incredibly short moments of time. Scientists can test the presence and nature of these virtual particles with particle beams traveling in a magnetic field." In 1967, Wilson brought five American Bison to the site, a bull and four cows, and an additional 21 were provided by the Illinois Department of Conservation. Some fearful locals believed at first that the bison were introduced in order to serve as an alarm if and when radiation at the laboratory reached dangerous levels, but they were assured by Fermilab that this claim had no merit. Today, the herd is a popular attraction that draws many visitors and the grounds are also a sanctuary for other local wildlife populations. ^ Fermilab. "Before Weston". Retrieved 2009-11-25. ^ "Fermilab director Oddone announces plan to retire next year". The Beacon-News. August 2, 2012. Retrieved 10 July 2013. 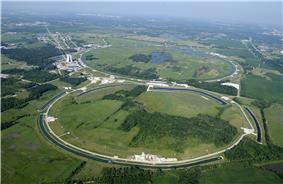 ^ "New Fermilab director named". Crain's Chicago Business. June 21, 2013. Retrieved 10 July 2013. ^ National Science Foundation. "The US and LHC Computing". Retrieved 2011-01-11. ^ "About Fermilab - The Fermilab Campus". 12/01/2005. Retrieved 2007-2-27. ^ "Fermilab physicists discover "doubly strange" particle". Fermilab. 9 September 2008.